Will Nelson Mandela Help Justify Obama's 100 Million Dollar Vacation? Will Nelson Mandela Help Justify Obama’s 100 Million Dollar Vacation? Even while President Obama, the wife, kids, mother-in-law, and niece are on a $100 million de facto vacation masquerading as a trip to Africa to promote “investment, development and democracy,” back in America, children still cannot tour the White House during summer vacation thanks to the sequester. On his trip to Senegal, South Africa, and Tanzania, Obama has three generations of family in tow. The objective of the trip, besides sightseeing and squeezing in another summer excursion, is to see if a man mistakenly identified as a son of Kenya can get back in Africa’s good graces after China has replaced the U.S. as the trading partner of world’s second-largest continent. G. W. Bush will be in Africa at the same time as President Obama. After addressing the HIV/AIDS issue in Africa and, as acknowledged by Bono, helping to save nine million lives, G.W. is forging ahead with a new philanthropic mission: a global initiative to refurbish a cervical cancer and screening treatment center. Laura Bush is with her husband in Africa and plans to attend, as is Michelle Obama, the African First Ladies’ Summit in Tanzania hosted by the G.W. Bush Institute next week. However, unlike Michelle Obama, Mrs. Bush will not be found sampling fried fat cakes, nor will her new granddaughter Mila Hager be accompanying grandma and grandpa on the trip. The primary purpose of the Bush’s trip is to extend charity to others, not sneak in a freebie vacation. Due to return home on July 3rd, regrettably, Barack Obama may be in South Africa at just the right time to insert himself into Nobel Peace Prize laureate Nelson Mandela’s funeral. Mandela is still alive, but currently the 94-year-old former South African President is in a hospital in Pretoria in grave condition with a recurring lung infection. And Mandela passing away while the Obama family grifters are pretending to be on official business would be sad. But wait! Actually, it would come just in the nick of time to justify spending $100 million during the sequester. If Nelson complies and expires by July 3rd, the president could write off his extended family’s African adventure expenses as a necessary result of their burning desire to pay homage to a great leader by attending a state funeral. After all, Mr. Mandela is the “patriarch of racial equality” in South Africa, and much like Mr. Obama was South Africa’s first black president. 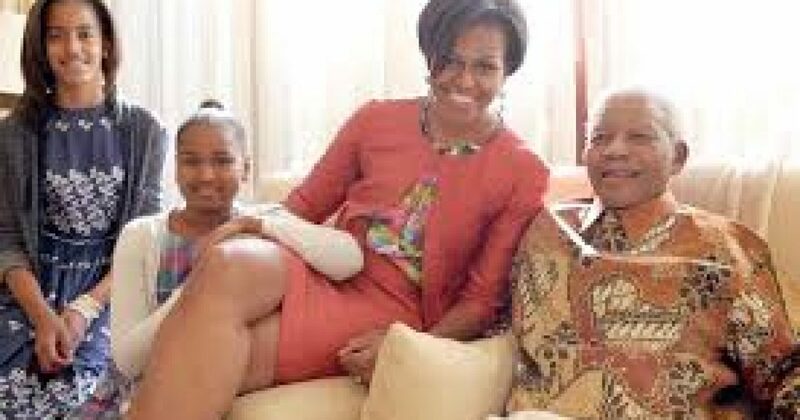 Moreover, a sure-to-be grief-stricken Michelle, Sasha and Malia, Grandma Marion and Mrs. Obama’s niece, as well as a nephew, met with Mandela on Mrs. Obama’s last African trip in 2011. So while closing down the White House tours to save money during the sequester is justifiable, apparently so is spending $100 million to take in a cultural performance of the Baba wa Watoto troupe (which translates to ‘father of children’ in Swahili) – if the Obama ladies can pull it off by pretending to be mourners at Mandela’s funeral.